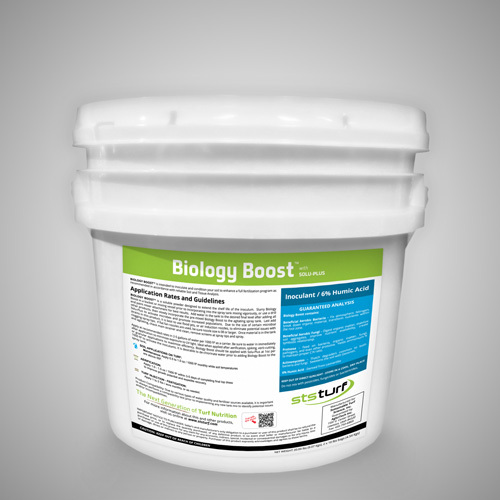 Biology Boost is a diverse microbial inoculant to colonize and boost biology in the rhizosphere. These organisms are vital to the reduction of organic matter, and converting mineral wastes into plant nutrients. Biology Boost bolsters nitrogen fixation, thatch and organic matter degradation, nutrient cycling and soil health. Biology Boost delivers a diversified package of microbial species of plant and root zone microorganisms to assist in the balancing of beneficial aerobic microbes. Bacteria - Are responsible for breaking down organic material, keeping levels of environmental stress down, and transforming nutrients within the root zone. One of the most important functions is converting nitrogen (including atmospheric N) into a form plants can use. Fungi - Like bacteria, fungi digest organic material yielding nutrients that turf can utilize. Certain fungi make phosphorus and nitrogen available to plants, while others help stabilize soil aggregates by binding soil particles together. Protozoa – Feed on bacteria, organic matter, fungi, pathogens, and even other protozoa. They produce ammonium nitrogen as a result of maintaining their proper C to N ratio. Protozoa are necessary for a healthy microbial community in soils. Actinomycetes - Are organic matter decomposers common to both bacteria and fungi. The sweet earthy smell of healthy soil indicates the presence of geosmin, a byproduct of actinomycetes.